A standup paddleboarder in Florida came face to face with a shark Thursday in the waters off Jupiter in Palm Beach County. Maximo Trinidad shot video of the close encounter while boarding on his lunch break near Corners Beach, according to NBC affiliate WPTV in West Palm Beach. The footage shows Trindad along when suddenly, his board clips a large shark to his left, sending Trinidad straight into the water. "As soon as I saw that big beautiful animal jumping next to me, everything went into slow motion. I didn't want to be on top of it and think I was a fish," he told WPTV. "Everything was so surreal. It was so cool." 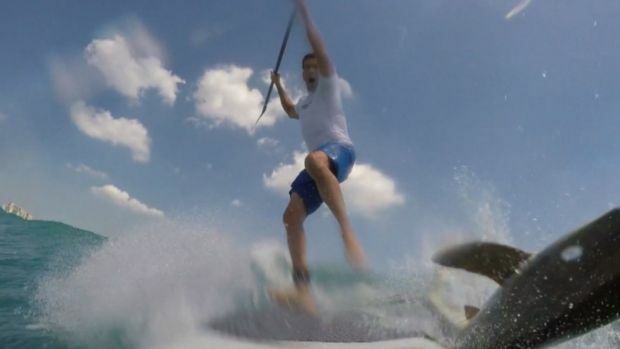 A Florida paddleboarder's camera was rolling Thursday, April 7, 2016 when he had an awesome close encounter Thursday with a shark off the coast of Jupiter. Trinidad is seen on video climbing back on top of his board and letting out an expletive in reaction to the incredible encounter. He told WPTV this wasn't his first experience with a shark. On another occasion, a shark jumped so high next to him it nearly reached eye level, Trinidad said.